Witten was born in Baltimore, Maryland, to a Jewish family. He is the son of Lorraine (Wollach) Witten and Louis Witten, a theoretical physicist specializing in gravitation and general relativity. Witten attended the Park School of Baltimore (class of '68), and received his Bachelor of Arts with a major in history and minor in linguistics from Brandeis University in 1971. He published articles in The New Republic and The Nation. He worked briefly for George McGovern's presidential campaign. Witten attended the University of Wisconsin–Madison for one semester as an economics graduate student before dropping out. He returned to academia, enrolling in applied mathematics at Princeton University in 1973, then shifting departments and receiving a Ph.D. in physics in 1976 under David Gross, the 2004 Nobel laureate in Physics. He held a fellowship at Harvard University (1976–77), visited Oxford University (1977–78), was a junior fellow in the Harvard Society of Fellows (1977–1980), and held a MacArthur Foundation fellowship (1982). By the mid 1990s, physicists working on string theory had developed five different consistent versions of the theory. These versions are known as type I, type IIA, type IIB, and the two flavors of heterotic string theory (SO(32) and E8×E8). The thinking was that out of these five candidate theories, only one was the actual correct theory of everything, and that theory was the one whose low-energy limit matched the physics observed in our world today. In collaboration with Nathan Seiberg, Witten established several powerful results in quantum field theories. In their paper on string theory and noncommutative geometry, Seiberg and Witten studied certain noncommutative quantum field theories that arise as limits of string theory. In another well-known paper, they studied aspects of supersymmetric gauge theory. The latter paper, combined with Witten's earlier work on topological quantum field theory, led to developments in the topology of smooth 4-manifolds, in particular the notion of Seiberg–Witten invariants. With Anton Kapustin, he has made deep mathematical connections between S-duality of gauge theories and the geometric Langlands correspondence. Partly in collaboration with Seiberg, one of his recent interests include aspects of field theoretical description of topological phases in condensed matter and non-supersymmetric dualities in field theories that, among other things, are of high relevance in condensed matter theory. From a generalization of SYK models from condensed matter and quantum chaos, he has also recently brought tensor models of Garau to the relevance of holographic and quantum gravity theories. In general, Witten has done influential and insightful works in many aspects of quantum field theories and mathematical physics, including the physics and mathematics of anomalies, integrability, dualities, localization, homologies and so on. 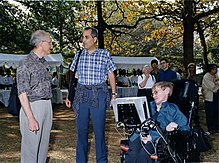 Many of his results have deeply influenced many areas in theoretical physics (often well beyond the original context of his results), including string theory, quantum gravity and topological condensed matter. In an informal poll at a 1990 cosmology conference, Witten received the largest number of mentions as "the smartest living physicist". Witten has been married to Chiara Nappi, a professor of physics at Princeton University, since 1979. They have two daughters, Ilana, a neuroscientist at Princeton University, and Daniela, a biostatistician at the University of Washington; one son, Rafael; and a granddaughter, Nava. Witten sits on the board of directors of Americans for Peace Now and on the advisory council of J Street. He supports the two-state solution and advocates a boycott of Israeli institutions and economic activity beyond its 1967 borders, though not of Israel itself. He is also a tennis player and a vegan. Roman Jackiw, David Gross, Sam B. Treiman, Edward Witten, Bruno Zumino. Current Algebra and Anomalies: A Set of Lecture Notes and Papers. World Scientific, 1985. Green, M., John H. Schwarz, and E. Witten. Superstring Theory. Vol. 2, Loop Amplitudes, Anomalies and Phenomenology. Cambridge, UK: Cambridge University Press, 1988. ISBN 9780521357531. Quantum fields and strings: a course for mathematicians. Vols. 1, 2. Material from the Special Year on Quantum Field Theory held at the Institute for Advanced Study, Princeton, NJ, 1996–1997. Edited by Pierre Deligne, Pavel Etingof, Daniel S. Freed, Lisa C. Jeffrey, David Kazhdan, John W. Morgan, David R. Morrison and Edward Witten. American Mathematical Society, Providence, RI; Institute for Advanced Study (IAS), Princeton, NJ, 1999. Vol. 1: xxii+723 pp. ; Vol. 2: pp. i–xxiv and 727–1501. ISBN 0-8218-1198-3, 81–06 (81T30 81Txx). ^ "Announcement of 2016 Winners". World Cultural Council. June 6, 2016. Archived from the original on June 7, 2016. Retrieved June 6, 2016. ^ a b c Woit, Peter (2006). Not Even Wrong: The Failure of String Theory and the Search for Unity in Physical Law. New York: Basic Books. p. 105. ISBN 0-465-09275-6. ^ a b Atiyah, Michael (1990). "On the Work of Edward Witten" (PDF). Proceedings of the International Congress of Mathematicians. pp. 31–35. Archived from the original (PDF) on 2017-03-01. ^ Michael Atiyah. "On the Work of Edward Witten" (PDF). Mathunion.org. Archived from the original (PDF) on 1 March 2017. Retrieved 31 March 2017. ^ The International Who's Who 1992-93, p. 1754. ^ Interview by Hirosi Ooguri, Notices Amer. Math. Soc., May 2015, pp. 491–506. ^ Witten, Edward (1989). "Quantum Field Theory and the Jones Polynomial" (PDF). Communications in Mathematical Physics. 121 (3): 351–399. Bibcode:1989CMaPh.121..351W. doi:10.1007/BF01217730. ^ Reshetikhin, Nicolai; Turaev, Vladimir (1991). "Invariants of 3-manifolds via link polynomials and quantum groups". Inventiones Mathematicae. 103 (1): 547–597. Bibcode:1991InMat.103..547R. doi:10.1007/BF01239527. ^ Witten, Edward (1981). "A new proof of the positive energy theorem". Communications in Mathematical Physics. 80 (3): 381–402. Bibcode:1981CMaPh..80..381W. doi:10.1007/BF01208277. ^ Schoen, Robert; Yau, Shing-Tung (1979). "On the proof of the positive mass conjecture in general relativity". Communications in Mathematical Physics. 65: 45. Bibcode:1979CMaPh..65...45S. doi:10.1007/BF01940959. 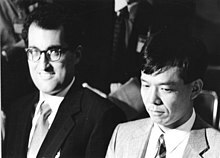 ^ Schoen, Robert; Yau, Shing-Tung (1981). "Proof of the positive mass theorem. II". Communications in Mathematical Physics. 79 (2): 231. Bibcode:1981CMaPh..79..231S. doi:10.1007/BF01942062. ^ Witten, Edward (1982). "Super-symmetry and Morse Theory". Journal of Differential Geometry. 17: 661–692. ^ Witten, Edward (1995). "String theory dynamics in various dimensions". Nuclear Physics B. 443 (1): 85–126. arXiv:hep-th/9503124. Bibcode:1995NuPhB.443...85W. doi:10.1016/0550-3213(95)00158-O. ^ Juan M. Maldacena (1998). "The Large N limit of superconformal field theories and supergravity". Advances in Theoretical and Mathematical Physics. AIP Conference Proceedings. 2: 231–252. arXiv:hep-th/9711200. Bibcode:1998AdTMP...2..231M. doi:10.1063/1.59653. ^ Edward Witten (1998). "Anti-de Sitter space and holography". Advances in Theoretical and Mathematical Physics. 2: 253–291. arXiv:hep-th/9802150. Bibcode:1998AdTMP...2..253W. ^ Seiberg, Nathan; Witten, Edward (1999). "String Theory and Noncommutative Geometry". Journal of High Energy Physics. 1999 (9): 032. arXiv:hep-th/9908142. Bibcode:1999JHEP...09..032S. doi:10.1088/1126-6708/1999/09/032. ^ Seiberg, Nathan; Witten, Edward (1994). "Electric-magnetic duality, monopole condensation, and confinement in N=2 supersymmetric Yang-Mills theory". Nuclear Physics B. 426 (1): 19–52. arXiv:hep-th/9407087. Bibcode:1994NuPhB.426...19S. doi:10.1016/0550-3213(94)90124-4. ^ Kapustin, Anton; Witten, Edward (2006-04-21). "Electric-Magnetic Duality And The Geometric Langlands Program". arXiv:hep-th/0604151. ^ "Edward Witten", The President's National Medal of Science: Recipient Details. ^ "Il premio Pitagora al fisico teorico Witten". Il Crotonese (in Italian). September 23, 2005. Archived from the original on 2011-07-22. ^ "Foreign Members", The Royal Society. ^ Lemonick, Michael (April 26, 2004). "Edward Witten". Time. Retrieved November 1, 2011. ^ Witten, Ed. "The 2014 Kyoto Prize Commemorative Lecture in Basic Sciences" (PDF). Retrieved 28 January 2017. ^ "Faculty » Ilana B. Witten". princeton.edu. Retrieved 18 November 2016. ^ "UW Faculty » Daniela M. Witten". washington.edu. Retrieved 9 July 2015. ^ "Advisory Council". J Street. 2016. Retrieved 2016-10-14. ^ "For an Economic Boycott and Political Nonrecognition of the Israeli Settlements in the Occupied Territories", NYRB, October 2016. ^ "Jewish American Physicist Says He'll Send Part of $3 Million Prize to J Street". JTA. 4 August 2012. Retrieved 18 March 2017 – via haaretz.com. This page was last edited on 4 April 2019, at 04:58 (UTC).